Got Questions about Fiberglass Pools? We’ve Got Answers! Fiberglass pools are steadily gaining in popularity, but they’re still only a recent addition to the current choices of pool surfaces such as vinyl liner and concrete pools. But how well-informed are you about fiberglass pools? If you’re shaking your head, don’t worry. We’ll tell you everything you need to know. What is the cost of an in-ground fiberglass pool? Do they work in cold climates? What shapes can you choose? What sizes can you choose? Are they easier to maintain than vinyl liner or concrete pools? Spraying gelcoat onto the mold. Applying chopped fiberglass with 100% vinyl ester resin. Applying chopped fiberglass with polyester resin. Applying woven roving at stress points for extra strength. Applying structural honeycomb materials to support side walls. Applying final layer of fiberglass with polyester resin. Removing pool shell from mold. Setting and levelling the pool. Installing the pool’s plumbing and filter system. Installing the coping and patio. Our installation technique combines innovative practices to prevent long-term issues such as leaks, separation, settling, and bulges. Typical installation of a fiberglass pool is about 2-3 weeks, including the pool, patio, and landscaping. You can swim in your pool by the end of the second day, compared to 4–8 weeks for a vinyl liner pool and 3–6 months for a concrete pool. And in the meantime, your back yard is a war zone and you can’t use the pool during that time. It’s a myth that fiberglass pools crack in cold weather. The principle is the same as frozen water in an ice cube tray. It doesn’t crack, but expands a little upward, not outward. Now to prevent the pipes from freezing and possibly cracking, it’s important to winterize your pipes by blowing out the water and plugging them during the off-season. 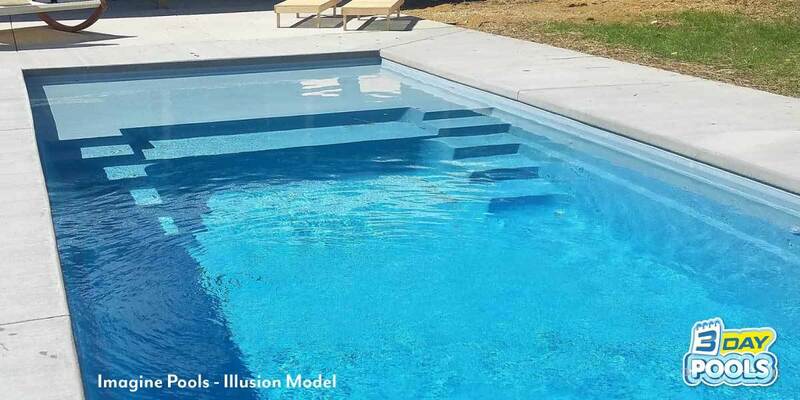 Fiberglass pool shapes can’t be customized like concrete or vinyl liner pools because they’re built from existing molds. They also can’t be larger than 16’ x 40’ as they are delivered by road to your home. What are the biggest and smallest fiberglass pools? However, there are still many options available. All fiberglass pool manufacturers produce different designs. Most customers find the perfect design they love that fits their budget. Fiberglass pools can be as small as 10×20 and are the perfect choice for small yards. They can be as large as 40’ x 16’, but not much more, again because of road transportation restrictions. What are the biggest and smallest fiberglass pools? Fiberglass pools are manufactured from moulds in a factory, so choices of size and shape are limited to prefabricated shapes. Properly installed and maintained fiberglass pools will never float or pop up if proper prevention methods are used. It should always have a ground water management sump system. We provide a ground water management sump pump system, so you can monitor and remove groundwater. We also use Fiberglass Pool Fasteners and an extra-strong concrete bond collar to lock the pool and patio in place. Always keep the pool filled with water as the water weight helps prevent the pool from popping up and floating. The structure of the pool should last at least 50+ years. We’re so confident in our pools that we offer a lifetime structural warranty indicating that the pool won’t leak as long as it’s used as a regular pool. The gelcoat surface should also last decades as long as the pool is properly manufactured and maintained. All pools lighten to some extent. A gelcoat surface will lighten over time, but evenly and gradually. As long as the gelcoat surface is properly manufactured and maintained, it the most durable pool coating available in appearance and life expectancy. If you compared a new colour sample to a 10-year-old pool, you may notice some difference but more likely you wouldn’t not be able to tell. Improper water chemistry is primarily responsible for premature or uneven fading of the gelcoat surface. The structural warranty outlines how long the manufacturer guarantees the pool will hold water, which typically lasts for the life of the pool, or as long as the pool is owned and in normal use. Can you transfer the warranty? Because the gelcoat surface doesn’t have the pores and cavities of concrete pool plaster, it remains smooth and algae-resistant. As long as a fiberglass pool’s gelcoat is properly manufactured and maintained, it should never need to be refinished. We pride ourselves on being an innovative industry leader both in product and customer service. We install every pool in exactly the same way (Properly! ), excavate to the exact manufacture’s procedures, and use a high quality HBP backfill. We use only clean, crushed HBP stone for backfill. Unlike standard industry sand, when wet, crushed stone doesn’t move or change properties. We use a super strong concrete collar to lock the pool in place to prevent it from moving and separating from your patio. The sump pipe we provide allows you to access the bottom of the hole where your pool sits. This enables you to remove groundwater that collects there if a professional needs to drain your pool.